MagniSlide™ 3x Credit Card Size, Kosmos Scientific de México, S.A. de C.V. 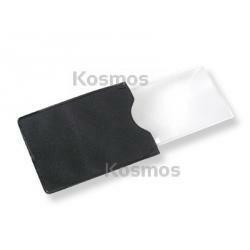 The CAMC-22 MagniSlide™ is a "credit card size" page Fresnel Magnifier that slides-out of its lock-on soft case. The MagniSlide™ Magnifier is small enough to fit in your wallet and lightweight enough to carry all the time! The MagniSlide™ Magnifier is ideal for reading fine print including maps and menus.